The following are instruction manuals for the Game Boy Advance game Sonic Advance 3. 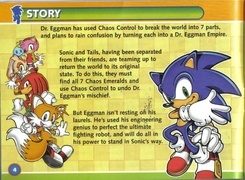 Dr. Eggman has used Chaos Control to break the world into 7 parts, and plans to rain confusion by turning each into a Dr. Eggman Empire. Sonic and Tails, having been separated from their friends, are teaming up to return the world to its original state. To do this, they must find all 7 Chaos Emeralds and use Chaos Control to undo Dr. Eggman's mischief. But Eggman isn't resting on his laurels. He's used his engineering genius to perfect the ultimate fighting robot, and will do all in his power to stand in Sonic's way. This page was last edited on 23 March 2018, at 18:20.